For those that do not know much about FFWCT, can you explain what it is and how it all started? 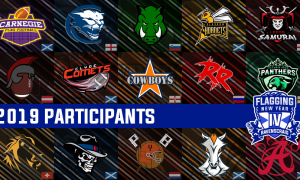 FFWCT is a global initiative to bring flag football to all corners of the earth while promoting a global tournament series that allows any amount of teams from any country to compete for a world title in their respective format. 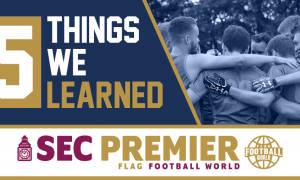 How big is flag football in the U.S and how much has it grown since FFWCT has been around? Flag Football is massive in the United States. 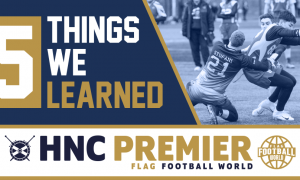 Flag Football has seen some incredible strides since FFWCT has moved the sport along. We are the first tournament series to throw multi format cash prize tournaments. We have the largest single cash prize tournament in the world at just north of $40,000.00 in cash prizes, we are the most followed flag football company on social media and in the world as well. FFWCT’s next event is Battle Orlando; can you tell us a little about it? 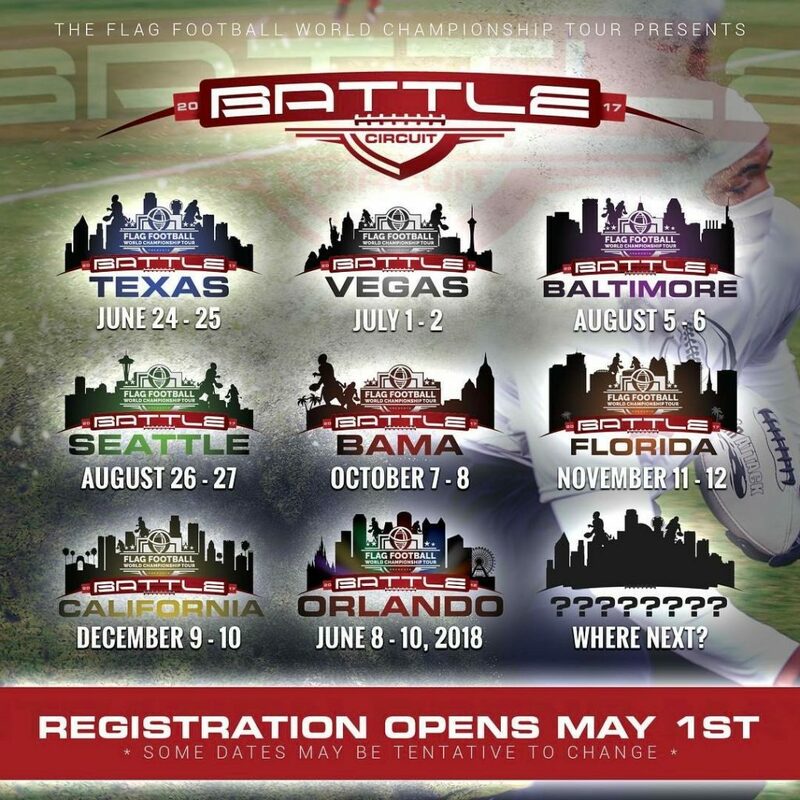 Battle Orlando is our flagship event and in 2018 will be the Official Flag Football World Championships! This year alone it will feature 350+ teams and 15,000 people. Next year, for the Flag Football World Championships we are looking to get 500+ teams and 20,000+ in attendance. What is the format of the tournament and how many days does it span over? Our tournament is multi format so we have 4v4 & 5v5 non-contact, 5v5 Contact, 7v7 Screen, High School passing 7v7, High School Girls Passing, 8v8 Screen, 8v8 Coed, 8v8 Contact Lineman eligible and 9v9 Contact Lineman ineligible. The Tournament is over 4 days. The 1st day is just media day at Universal Studios with the next 3 being playing days. What made you include so many different formats? 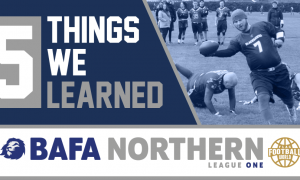 We feature multiple formats from 4v4 to 9v9 because here in the United States, every region plays flag football differently. Most teams even play multiple formats. Can you tell us about the location for Battle Orlando and how difficult is it to source for a tournament of this size? Battle Orlando this year will be played at Northeast Regional Park, which is a 6 field, all-turf complex just outside Disney World. We also have Simmers Young Regional Park which is a 12 field grass complex about 20 minutes away. It is incredibly hard to find enough fields to play. For 2018, we are looking to move the world championships to a much larger venue! How do you select the Location/venues? We go through a pretty sturdy vetting process to make sure the location is geographically sound and has adequate playing surfaces. We also try to prime it with local attractions so that the players and families enjoy the atmosphere of that city. How do you go about registering a team? You simply go to www.battleorlando.com and click on the format and division in which you would like to register for. The team captain or coach would register the team with a $50.00 deposit that doubles as the team deposit/spot hold for the tournament and the captain’s personal entry fee to play as well. He or she will then proceed to put each player on their roster with first name, last name and email. Once that is completed for every player, those players will receive an email stating that they have been added to the team. They will be prompted to pay their own personal entry fee to play of $50.00 and that’s it! We don’t have a team fee for our tournaments. What is the maximum number of teams? There is no maximum number of teams! We would love to have 1,000 teams one day! Other than American teams, what other countries tend to send teams? We have teams coming from New Zealand, Mexico, Indonesia, Canada, Panama, and The Cayman Islands. Have there been any European entries this year or before? Typically no! Still looking to get a large group of those teams to come over and compete. There’s is quite a few sponsors for the tour. Can you tell us about them and how they became associated? Yes we have outstanding brand partners such as EA Sports, NERF, Hotels.com, Sportira, Red Bull, Body Armor, Xbox One, Universal Studios and Buffalo Wild Wings. They are all mutually beneficial and share excellent synergistic goals. They love to support athletic endeavours that promote a healthy and active life style while providing all of the perks of a tourist destination. Running these tournaments cannot be easy. How big of a team do you have? For Battle Orlando we will have a pretty sizeable team! We will have probably 80-100 Referees and 20+ members of our leadership team and another 15-20 people on our Media Team. What has been the most successful tour to date? We have had a number of milestones, we threw together a mostly travelled tournament in Alabama in under 3 weeks of promotion. It resulted in over 50 teams registering! Battle Orlando honestly has surpassed our imagination. We had rather humble expectations and its just exploded. What other events is there to watch out for? We have our entire battle circuit coming up for 2017 with big stops in Dallas Texas, Los Angeles California, Las Vegas, Seattle Washington, and Baltimore Maryland. Would FFWCT Consider hosting outside of the US? Yes, part of our Operational master plan is to expand internationally by 2019! Any more detail you would like to add? 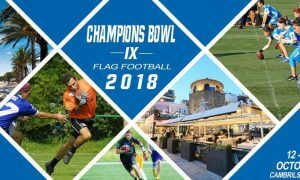 Yes, all of the international teams looking to compete in a massive global tournament should start to plan their travel for June 2018 so they can participate in the Flag Football World Championships. Thank you for your time, Charles! 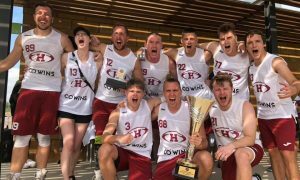 For any further details on Flag Football World Championship tour you can visit the site here or on Facebook and Instagram.